This weeks featured bundle of the week has been the top seller in the New Holiday Catalog according to Stampin' Up! So many of you may already own it! Hopefully these posts over the next few days will inspire you to use it. If you don't own it yet...I would highly recommend it! It's cute and super fun! This includes the punch, AND a 10% discount! Let's look at a few samples! 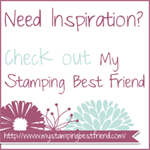 One that we designed in my studio, and another one from Stampin' Up! Turn the punch upside down and you have a reindeer! Download the tutorial here for a supply list, and some tips! We'll be showing a few more posts this week...be sure to come back! This week at the Create with Ronda Studio we worked on getting our September Online Classes in the mail! The Elf Class and a Frames class! It takes us all week to prep for the projects, but we love doing it! Here is Michelle helping me! I decided we should build a tower to see how high we can get it! Here's a couple glimpses of just two of the 12 projects they would make. Next month you'll have to check back for 2 more awesome classes! If you missed these classes you can always catch them on CREATIVE CORNER! I post all my online classes there each month, along with lots of other projects all month long! Your first month is only 5.00 to check it out!